Hardware Lane by Sarah Oberklaid. Article Note: This is the first installment of a two-part series on laneways, see Part 2. Only a few decades ago, the intricate network of laneways in Melbourne, Australia, carved into the street grid by property owners for access, sewerage, and waste disposal during the Victorian era, were overlooked and devoid of life. As a result of incremental initiatives, Melbourne’s laneways are now world-renowned — transformed into inviting passages, lined with an enviable mix of alfresco eateries, unique bars, boutiques, street art and residences. 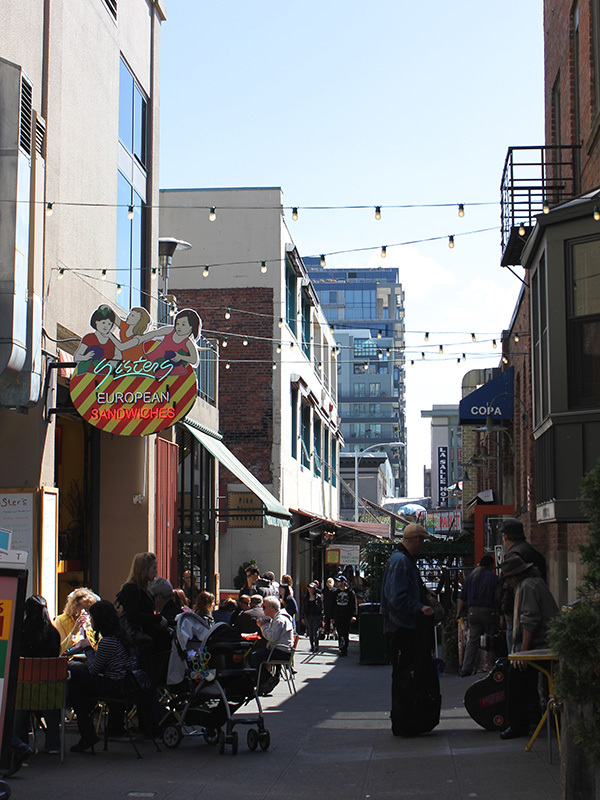 Given growing interest and efforts to enliven alleyways in Seattle, the revitalization of Melbourne’s laneways provides an example of re-envisaging these spaces as public assets. 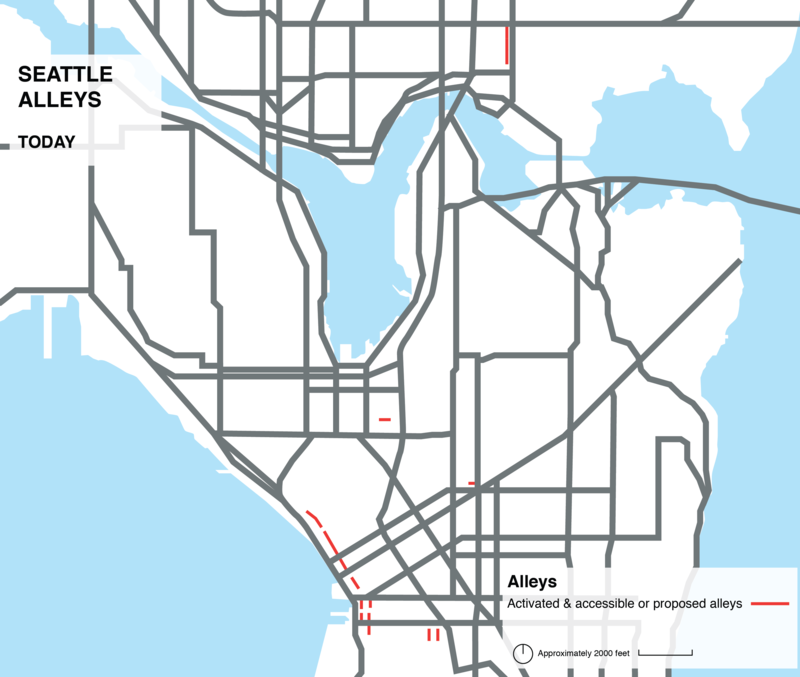 Map of Seattle’s alleys today by Sarah Oberklaid. In 1994, only 300 meters of laneways in central Melbourne were considered to be activated and accessible. But within 10 years this had increased 10 fold to approximately 3km. This change is significant. The City of Melbourne’s Walking Plan (2014) estimates increasing walking connectivity of the central grid just 10%, generates an additional $2.1 billion per annum to the local economy. 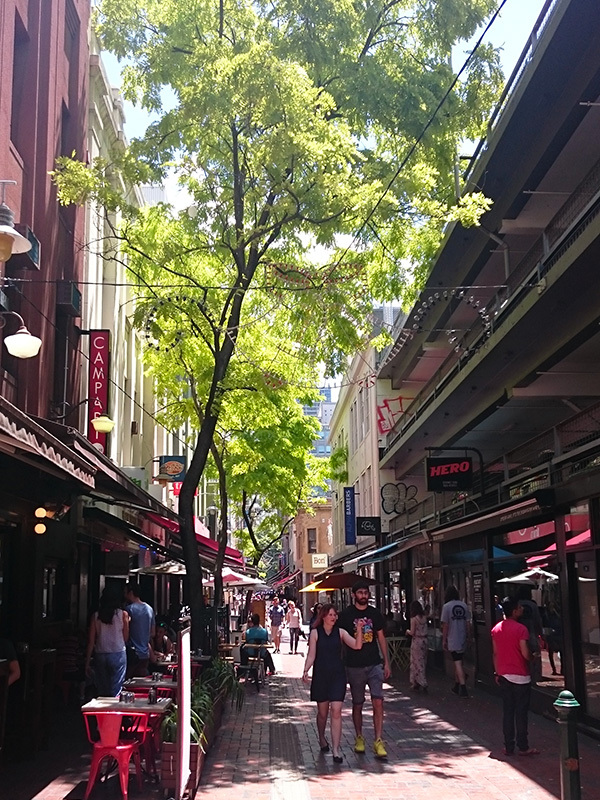 Melbourne’s lanes are unique public spaces, providing important north-south connections as well as interesting places for social interaction, outdoor dining, live music, and art. They also provide a service function for waste management and car parking access. 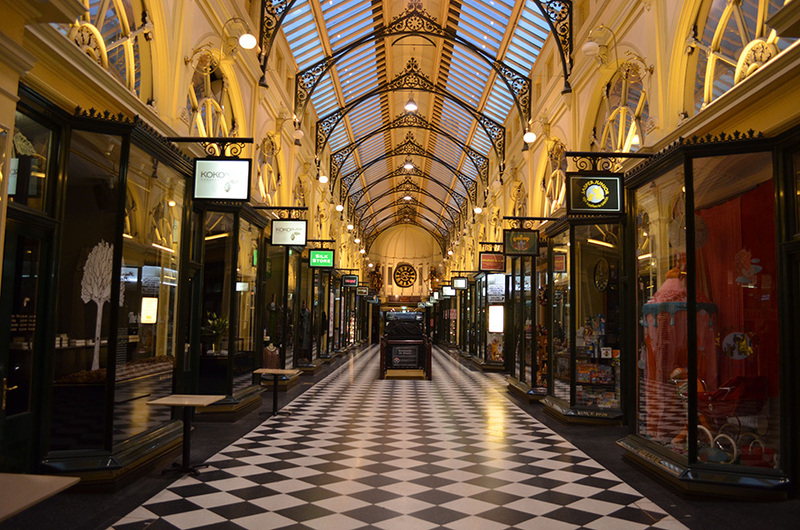 This image of Melbourne’s Royal Arcade, constructed in 1869, was taken before 7am on a weekday. The arcade provides a north-south pedestrian connection protected from the elements and traffic. Photo by Matthew Oberklaid. Melbourne: Hardware Lane has a mix of cafes, bars and restaurants with seating extending into the lane. In the evenings this is bustling with street-side diners and musicians Photo by Sarah Oberklaid. Seattle: Post Alley also has a mix of shops and eateries which spill into the alley. Photo by Sarah Oberklaid. Melbourne: The Causeway is lined with cafes & boutiques. This photo was taken at 7.30am, showing people feel comfortable walking at different times of day. Photo by Matthew Oberklaid. Seattle: An alley in the University District activated with a cafe. Photo by Sarah Oberklaid. The City required new buildings to be built to site boundaries, discouraging large paved plazas, to maintain the street edge, and ensure a strong connection between buildings and the pedestrian on the street. A percentage of the street facade of new buildings were required to have active frontages, such as shops or businesses, to provide a visual or physical interaction between the ground floor and public space. This policy arguably supported small tenancies and continually increased retail spaces, ensuring a steady supply which played a role in maintaining competitive rents, offering opportunity for experimentation by diverse and independent businesses. The historic bluestone paving of Melbourne was preserved, or reinstated in sidewalks, most notably in the laneways. Across the City, these detailed design qualities, reflect the mantra of the City’s Director of City Design, Professor Rob Adams, “If you can design a good street, you have a good city”. With more inviting and interesting streets, laneways and public spaces for pedestrians to enjoy, people spent more time in them. 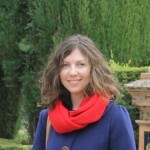 See Part 2 which discusses other factors which contributed to the activities on Melbourne’s laneways today, including liquor law reform, initiatives to encourage more residents to live in the central city, and public art, in addition to the benefits of the City’s public life research and contemporary development enhancing the laneway network.